The alert, lively Belgian Malinois has been hard at work for centuries, originally as a sheepdog in Belgium and beginning in the 20th century, as a military and police dog. They are known for their fierceness and fearlessness as members of K-9 units around the world. Mals are tireless and focused when there's a job to do or a frisbee to catch, and affectionate and loyal at the homestead. Well muscled and athletic, Mals are best suited to very active owners who are happy taking them for frequent runs and long hikes. Belgian Malinois are also known as Mals, Malis, and Maligators—a mash-up of Malinois and alligator, likely inspired by their bite work as police dogs. Coat - Belgian Malinois have a short, dense double coat. Their rugged, weather-resistant fur is very close on the head and legs, and slightly longer on the neck and tail. The coat color ranges from deep fawn to mahogany with black tips. They have a black mask and ears. The Belgian Malinois stands with a proud carriage and an alert expression. He has a lean, solid build that conveys his underlying agility. His stride is even and seemingly effortless. Because of his herding roots, he tends to run in a curving path rather than a straight line. Mals have a quiet confidence and are admired for their attentiveness to the commands of their owners. Belgian Malinois emerged from a long line of Belgian sheepherding dogs known as the 'Chien de Berger Belge.' In the early 1900s this collective breed was split into separate varieties, primarily distinguished by coat. Malinois have short hair, Tervurens have long fawn or red coats with black points, Laekenois are wirehaired, while Belgian Sheepdogs have long, black hair. In the early 1900s, the Malinois became popular as a police and war dog because of his protective nature and sharp intelligence. Today, Malinois are still frequently used as police dogs, and bomb and drug sniffing dogs, as well as for search and rescue. Belgian Malinois exude confidence and alertness. They are often reserved around strangers, but they are not shy or aggressive. Mals are always attentive and at the ready, whether to play a game with their owner or protect them from threats. They are known to be aggressive with strange dogs, especially without proper socialization. Are Belgian Malinois Good with Kids? Belgian Malinois are loving and patient with the children from their own family. They should always be watched around kids, however, because these herding dogs will try to wrangle children who get unruly. Are Belgian Malinois Good with Other Pets? Mals have a strong prey drive and, as a result, can possibly be dangerous for small pets, including cats. They are usually good with dogs they have been socialized with from an early age, though they can be domineering. Visits to dog parks are not in the cards for Belgian Malinois, and they should be monitored with strange dogs even on leash. Belgian Malinois are known for being highly protective of their people. Are Belgian Malinois Good Guard Dogs? Belgian Malinois make excellent and fearsome guard dogs. They will keep an eye on the perimeter of your property and sound the alarm if anyone comes near. Their appearance can be intimidating, which also acts as a deterrent for would-be intruders. Belgian Malinois are extremely energetic. They need to be kept active and engaged all day, or they are inclined to become bored and turn to destructive behaviors, such as chewing and barking. The Belgian Malinois needs frequent exercise and mental stimulation. He will resort to destructive habits if he is bored by a lack of activity. He can be wary of strangers. He can be intimidating for some people. Early socialization with dogs and people is critical. Indoor Loyal and attached to their families, Belgian Malinois belong inside with them. Mals are not ideal dogs for apartment dwellers because of their need for activity. Outdoor It's important that Belgian Malinois spend a lot of time outside working, training, playing, or exercising. Their hearty coat protects them from bad weather. Be aware that this is a highly athletic and agile dog known for his ability to scale walls and fences in police work. Your Malinois should not be left alone to run around the back yard, because he can all too easily escape. Exercise A healthy Belgian Malinois needs several hours of vigorous activity each day. His energy reserves seem endless, and walks are simply not enough to wear him out. A healthy, manageable Mal demands an owner who is able to give him the exercise he requires. Endurance Belgian Malinois have the stamina for long bouts of training or dog sports. You will almost assuredly run out of energy before your Mal does. Running Miles: A healthy Belgian Malinois can run upwards of five miles by your side. Some Mal owners ride bikes with their Malinois running alongside. Hiking Miles: Belgian Malinois can manage half-day hikes with ease. Food Belgian Malinois require about two to three cups of quality dry dog food each day, split between two meals. The amount will vary depending upon the size, weight, activity level, and age of your dog. Talk with your veterinarian about an optimal diet plan. Alone Time If Belgian Malinois are left home alone with nothing to do for hours on end, they'll find something to occupy themselves and chances are you won't like it. They are tolerant of an hour or two alone, but beyond that will need exercise scheduled into their day to get rid of excess energy and avoid destructive behaviors. The short coat of the Belgian Malinois requires moderate care—brushing a few times a week and a bath once a month will keep it clean and smelling pleasant. Clip your Malinois' toenails once or twice a month as needed, and check and gently clean his ears with a mild cleanser once a week to prevent wax buildup, which can cause infections. Brush his teeth daily. You can minimize serious health concerns in a Belgian Malinois by purchasing from a reputable breeder who engages in responsible breeding practices, and through screening for common diseases and conditions. Belgian Malinois are highly intelligent and will learn the beginner commands quickly. Advanced obedience and dog sports training are important for Mals, who need a great deal of mental stimulation and exercise. The breed shines at rally training, flyball, tracking, and Frisbee, among other sports. Malinois are sheep herding dogs rather than hunters, but they can be trained as trackers. No. Belgian Malinois shed and, as a result, leave pet dander in your home. Dander is the cause of most pet-related allergies. Why Are Belgian Malinois Called Maligators ? It's a mash-up of Malinois and alligator, and comes from their bite work as police dogs. Do Belgian Malinois Like Water? 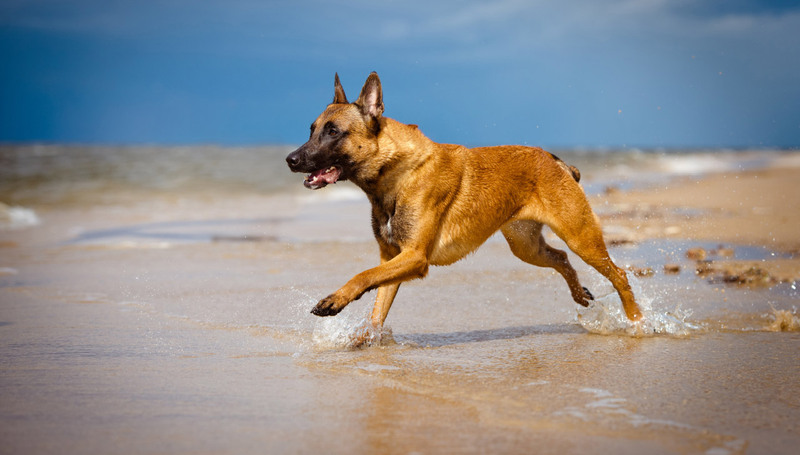 Belgian Malinois are strong swimmers and many like swimming. They are known as strong competitors at dock diving events.